Monthly Review Press, 9781583670668, 384pp. The First Amendment of the U.S. Constitution is a landmark in the defense of free speech against government interference and suppression. In this book we come to see how it also acts as a smokescreen behind which a more dangerous and insidious threat to free speech can operate. Soley shows how as corporate power has grown and come to influence the issues on which ordinary Americans should be able to speak out, so new strategies have developed to restrict free speech on issues in which corporations and property-owners have an interest. 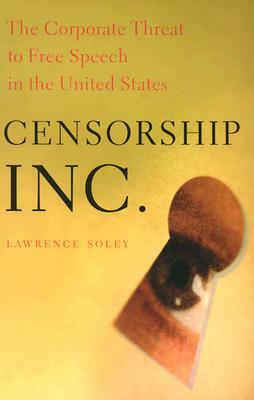 Censorship, Inc. is a comprehensive examination of the vast array of corporate practices which restrict free speech in the United States today in fields as diverse as advertsing and the media, the workplace, community life, and the environment. Soley also shows how these threats to free speech have been resisted by activism, legal argument, and through legislation. Grounded in extensive research into actual cases, this book is at the same time a challenge to conventional thinking about the nature of censorship and free speech.